Our new spring candles were delivered upstate a few days ago. 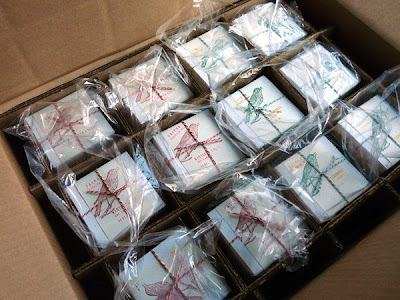 We're here now to pack them up with labels and string ... we will start shipping them tomorrow. Thanks to all of you who have been so patient, I think they will be worth the wait. I'm trying to think of something clever to say, but can't. Ok, happy easter kids...I'm turning my computer off to go raid my sister's easter basket. Because I didn't get one. The packaging is so pretty! I love it. Happy Easter. 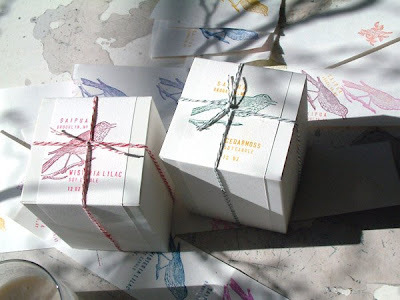 We've ordered your soap for our shop and would love to hear more about the candles.. The candles look beautiful. Congrats on finally settling on names!